Polegate MP, Norman Baker, has written to the transport secretary at central Government calling for a stretch of railway line to be built, which could cut journey times by around 20 minutes. Mr Baker and Nick Perry, Liberal Democrat candidate for Hastings and Rye, claim journey times between Polegate and Hastings could be cut if the short stretch of rail known as the Willingdon chord is built. They have written to transport secretary, Patrick McLaughlin, to press the case. Mr Baker says the new rail chord would enable trains between Polegate and Pevensey to bypass Eastbourne. 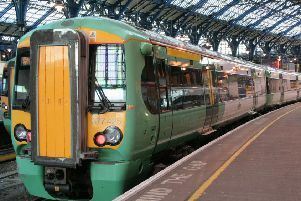 At the moment, all coastway trains have to divert via Hampden Park and Eastbourne, adding around 20 minutes to the journey between Lewes and Polegate at one end, and Hastings and Ashford at the other. Mr Baker said: “Installing the Willingdon chord would be good news for my constituents in Lewes and Polegate. It would make access to both Hastings and Channel Tunnel trains at Ashford easier and quicker, encourage freight traffic along the rail corridor, and generally improve the efficiency of the railway.